• Transfer Application Filing Dates: Fall semester filing deadlines for transfer applicants vary based on program. Visit admissions.uconn.edu for a complete listing of deadlines and admission criteria. is a prestigious Tier 1 research university that provides students unparalleled access to hands-on learning opportunities. Students learn and work alongside the top faculty in the field, professors who are dedicated to bettering the world through their research and inspiring students through advising and mentorship. 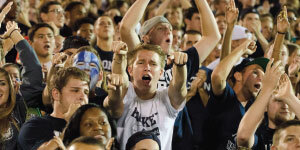 At UConn, students are encouraged to pursue their passions and learn what they love. Your community of peers will inspire you, challenge you, and make your best better every day. With one of the highest percentages of students living on campus of any public university in the nation, your friends will always be around—days, nights, and weekends. Residence halls, suites, and apartments each have their own ammenities, from volleyball courts to makerspaces. Over 650 clubs and organizations allow students to pursue interests outside the classroom—and the four art galleries and five theaters on campus ensure there are plenty of options to choose from on a night off from your studies. Live in one of our residence halls, suites, or apartments, and explore your passions further by joining one of 20 Learning Communities, where you live and learn among peers with similar interests. UConn’s five cultural centers serve as resources for the richly diverse and inclusive campus community comprised of students from more than 100 different countries. If exploration is what interests you, Education Abroad’s 250 organized adventures in over 60 countries provide experiential learning opportunities like no other. The presence of Connecticut’s flagship university is felt throughout the entire state. Regional campuses at Avery Point, Hartford, Stamford, and Waterbury complement our main campus in Storrs by offering small classes, esteemed faculty, exclusive internships, a variety of majors, and increased flexibility. Students can begin their studies at any of our regional campuses and seamlessly transition to the main campus in Storrs after 54 credits of course work. Select degrees may also be completed at a regional campus. Spirit. Pride. Tradition. Students past and present will tell you, there’s nothing quite like the UConn community. We’re tied together by the rush of cheering for our championship athletic teams and boundless love for our school. Winning is just one of UConn’s many traditions: women’s basketball holds the longest winning streak of any college basketball team, while the men’s basketball and the field hockey teams are both four-time national champions. 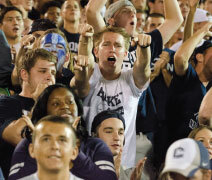 With 24 Division I athletic teams to root for, there’s no shortage of Husky pride on campus. UConn’s Center for Career Development is a resource for job preparation beginning as early as your first year. Take advantage of the annual Internship Fair, designed to help you make connections; meet with a career consultant one-on-one to learn about your career options; or attend mock interview workshops to sharpen your presentation skills. With over 650 companies actively recruiting students on campus each year, practice makes perfect and preparation is key. Everything you learn at UConn is designed to help you achieve your goals. You’ll carry your UConn experience with you through friends who become family, Husky pride that becomes part of your identity, and dreams that become your life. Expand your circle and join a network of 255,000 alumni worldwide. Interested in learning more about what UConn can offer you? 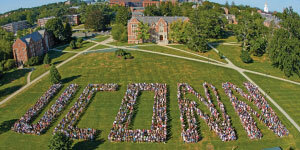 For details on the admission process or to schedule a campus tour, visit admissions.uconn.edu.